This was the Windsor mansion, built in 1859 and 1860 by a landowner who, ironically, died just a few weeks after it was completed, only 34 years old. For 30 years, Windsor was visible on the bluffs overlooking the Mississippi River (the river moved west over the next century, which confuses people who try today to envision the view from Windsor). But in 1890, a fire destroyed the home, leaving the ghostly visage that greets visitors today who venture a bit off the beaten path. 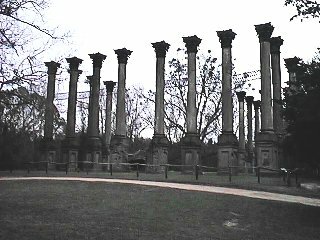 Only the columns remain at the place known by locals as the Ruins of Windsor. I was there last on a bleak, lonely, overcast December day a few years ago. For about an hour, I wandered the site, alone except for the hints of ghosts that seem to pervade it on a winter’s day. 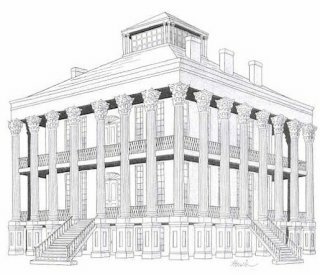 It has the stillness of a place frozen in time, the past clinging to the air around the stark columns. You feel like an intruder; after a few minutes, you find yourself looking behind you, unable to shake the feeling that someone is watching. It’s also one of those places that has a power – “I once meant something” – that makes you want to stay silent. It’s a rare treasure, a side trip worth the taking, even if it does leave you with a feeling of sadness that may take an hour or two to shake. 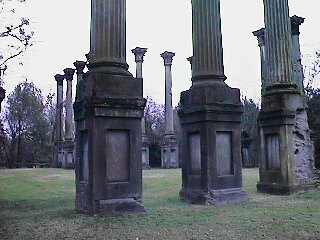 The columns will eventually crumble and fall, and be swallowed by the kudzu that has devoured so much of this part of Mississippi. Maybe then the spirit of the place can finally rest.